I know it’s silly for a Californian to complain about winter, but this year has been rough. It’s been wet, and cold, and dark. I listed to a lot of Fleet Foxes and Belle and Sebastian. It was a moody, broody time. This lightweight singlecloth striped dress is made from 100%, hand-dyed and spun cotton made by talented artisan weavers in India. Ace & Jig gets an overall “Good” rating on Good on You, so while there’s still room for transparency around their labor practices, I’m comfortable promoting their joyful, color-happy designs. This relaxed linen/rayon blend panel dress is happily made in New York, USA. Okay, this one’s technically a jumpsuit, but it’s swishy enough to make the cut. With stripe-blocked silk tassel-trimmed sash, this Made-in-the-USA number makes me want to frolic. Another gem from Ace & Jig, in a lovely shade of succulent. This particular shade of green slays me every time. And here it is, in full glory, on this 100% viscose dress that’s sustainably made in Los Angeles. After much anticipation, the Kelly Slater’s sustainable clothing company finally released a women’s line! The hand-printed fabric on this dress is sourced from Piece & Co., a company that empowers artisans in developing parts of the world. I’m a long time fan of Eva' Franco’s vintage-inspired designs. The Doris Dress, like all of the brand’s pieces, is made in the Los Angeles. Note: by the time I finished this post, there was only 1 dress left! Make sure to check out Eva Franco’s other spring pieces here. Tucker is a new brand on my radar. They’re on the pricier side, but the materials and fit appear to be top-notch (I’ve never purchased anything from them, so reviews are welcome!). 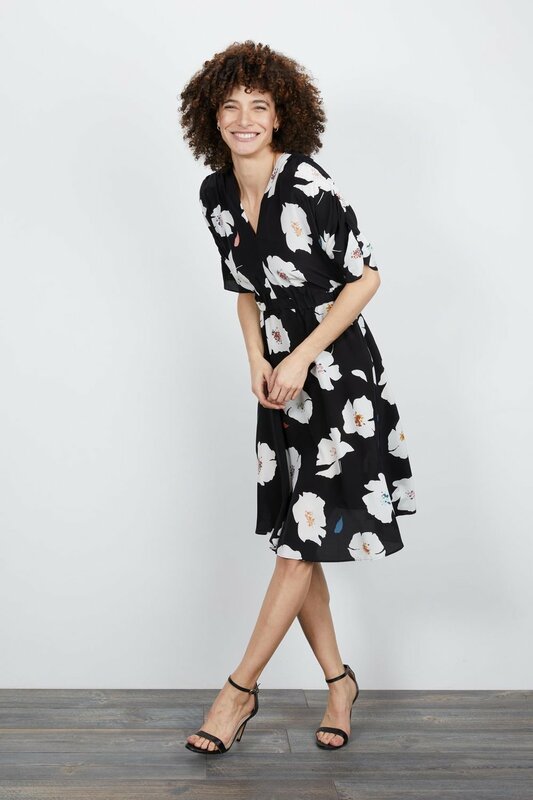 This dress is 100% crepe-de-chine and made in Tucker’s own factories, which allows them to monitor working conditions, pay all of their staff a living wage, reduce waste and over-production, and generally work toward more sustainable manufacturing. This post contains affiliate links. Thanks for supporting Birds of a Thread!